MONKEYS ARE MY FRIEND: Oh the Drama! It's been a while since I've done a knitting post so I thought I would remedy that. First thing: Christmas knitting! For multiple reasons, I'm not a fan of foisting my random knitting projects on people giving handmade gifts. Last year, though, I managed to give everyone on my list something knit. (I'm still not sure how that happened!) But this year I did much better and managed to only knit one! I did manage to put the poor birdie's legs on slightly incorrectly but I tacked them down to make them more where they should be. Otherwise, though, it was a fun little knit - and it let me learn how to do duplicate stitch. Yay! Slightly related to Christmas knitting, I knit something for myself over Christmas! We were traveling to visit family and my sweater project is so not a travel-able project. So I decided to make something that was portable and not too complex. Now I officially have a pair of fingerless mitts! They are nice and toasty - I enjoy wearing them. My one complaint about these is the yarn. I used Crystal Palace's Mochi Plus and I totally adore the colorway, but ugh!, the yarn is so loosely spun that it fuzzes like mad. So while I've worn the mitts for three days (mind you, I wore them for a fair number of hours on those three days) and now they look like I've been wearing (and washing) them everyday for months. Disappointing! The pattern, however, was super-fun. I didn't follow the directions exactly (apparently I knit like I cook - I can't follow anything exactly) and I did something completely different than called for on the thumb. Anyway, I'm really pleased with the pattern (and my changes). It makes me want to make more - but in a less fuzzy yarn. I think I'm insane. First off, I have four balls of this yarn. It's lovely yarn - not just the color but the texture and how it knits up... I love it. But almost all of the balls are different - one is more color intensive, one is pale and two are almost smack in the middle of the other two. (Gotta love hand dyed yarn.) So I've been alternating all four balls as I knit my sweater. It's been... interesting but I'm pleased with how well all of them are blending together so it is worth it. But now I've gotten to the sleeves. And I hate keeping track of row counts. And I have a past history of making things that should be the same size noticeably different sizes (due to gauge) when I don't make them at the same time. So I'm doing the sleeves two-at-a-time. Which means that I am rotating through four balls of yarn. On each sleeve. That's right, I'm knitting on something now with eight different yarns feeding into it. Right before we left for Christmas, I realized that I was knitting the sleeves with the wrong size needle! I had decreased needle size when doing the ribbing on the front band and forgot to switch back. Ack! I thought about just going on with it but this afternoon I ripped out the sleeves (which I hadn't gotten too far on) and started over. Ultimately, I knew the mistake would niggle at the back of my mind forever if I didn't fix it. Plus, a larger needle should maybe make the sleeves go a tiny bit faster. Faster is relative, though, since rotating, untangling and keeping track of eight (EIGHT!) 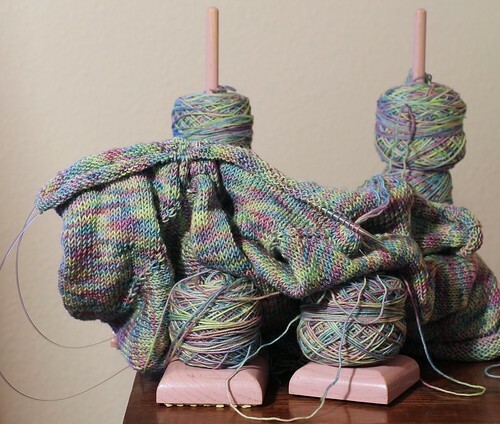 different balls of yarn slows things down a lot. But I'm in a pretty Zen place about it now because I really think this will end up awesome. At least, I hope so. Oh, lordy, please make it turn out awesome. 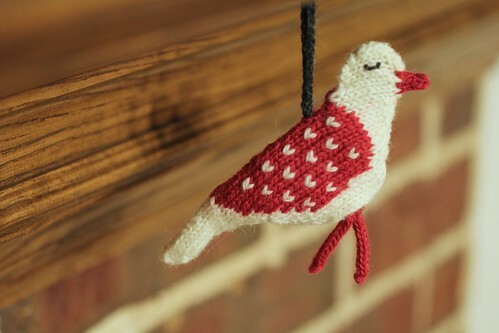 The bird is adorable, making ornaments was on my to do list this year... but I didn't get around to making any at all! I do think I'll start making an Advent Calendar within the next few months, I'm unsure whether I'll sew or knit that though. Not too many people get hand knitted or crocheted items from myself. But my father always manages to make his way onto the list, mainly because he loves the items I make him. This year I also purchased him some old westerns and documentaries of the Civil War. 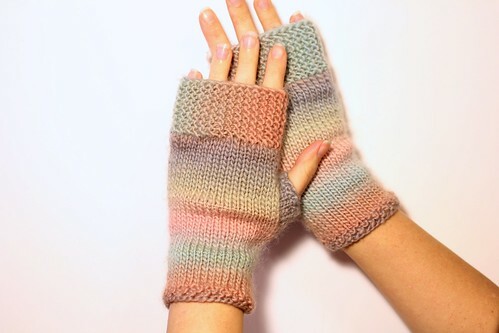 Love the fingerless gloves, they do look soft and warm. I never heard of that yarn, but I'll have to check it out. A few days ago I ordered some lovely Malabrigo yarn, never used it before but have heard a lot of great things about it; I've heard it's incredibly soft. Impressive that you have all those balls of yarn going at the same time, I find myself having to use a few balls for a project when I'm working with kettle dyed yarns. I rarely follow a pattern, so I can relate to what you wrote. Thanks for the compliments on the projects! Ornaments are such a good, fulfilling and quick project. Perfect for breaks when I'm working on my cardigan. I do have to be in a fairly calm state of mind to work on it just because of the crazy amount of yarn. I can't help but think that there must be a better way to do it but I can't think of it so I just surround myself in a web while knitting! I checked that yarn, it looks like that type was a single ply yarn. Depending on the project, I've found that single ply can look worn/pill easily. Especially in projects that get used often. I've used single ply merino before, just not Malabrigo. I have seen people recommend knitting at a tighter gauge to reduce those side effects. A few have also mentioned using 'sweater stones' to reduce the pilling. Malbrigo Rio is worsted weight superwash merino and it doesn't pill or look worn quickly. If I remember correctly, it's a four stranded yarn. It's on my list of yarn to try. I love single ply merino but will only use it in certain projects. I'm currently working on a simple hat using the single stranded Malabrigo. I knit it at a tighter gauge, and it shouldn't look worn too quickly, unless the person is going to be playing with the hat! Several years ago, I got a book from the library that talked about the types of wool, weight, strand, etc., and the best way to use them. I wish I could remember the books title, since it was really helpful. This evening, I'll be casting on a pair of fingerless gloves for my daughter. I made her one glove (per her request) this summer, and she chose that one glove (instead of the bought pairs that she has) to wear to school today. It's 'causal day' at school so the kids don't have to wear a uniform. I let her wear it since I drive her to school and she won't be going outside today. However I told her, "I'm making you gloves this weekend!" I have a few fingerless gloves, so I'll let her choose her favorite design. As much as I'd love to use a single ply yarn, I think I'll steer away from it. I do have some soft bright colored superwash wool, that I'll most likely use. Yes, the Crystal Palace is a loosely spun single ply. I've read the knit-at-a-tighter gauge trick before and I'll give that a shot to see how it goes with this one. But I think in general, I'm just learning my yarn preferences which seem to go towards more tightly spun and multiple ply stuff. I like the structure and neatness of it!